Yonatan Frimer Maze Cartoon of Hamas derailing the peace train by bombing and shooting durring the peace process. 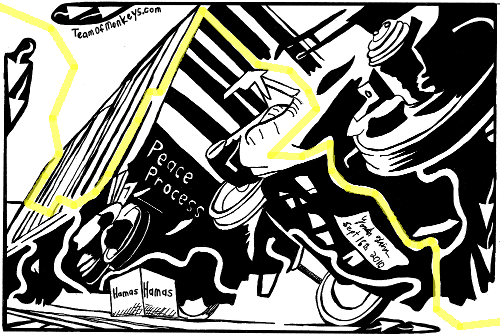 Maze cartoon of Hamas derailing the peace train. Maze cartoon of the middle east peace process getting derailed by Hamas. Click here for the solution to Hamas derailing the peace train. Short-range rockets and mortars rained on southern Israel yesterday as militants sought to derail the revived peace process on the second day of talks between Israeli and Palestinian leaders. Militants in Gaza, the coastal enclave controlled by Hamas, fired at least nine projectiles into Israel, causing no injuries. Israel responded with an air strike on Gaza, killing a 23-year-old Palestinian man. The upsurge in attacks came during talks in Jerusalem, where Washington is pushing for a breakthrough in the peace process, launched a fortnight ago after nearly two years of stalled negotiations. At the end of the second day, George Mitchell, the US envoy, sounded a cautious note of optimism, hinting that the two sides were making progress over the extension of a construction freeze in the Jewish settlements in the occupied West Bank. "We continue in our efforts to make progress in that regard and believe we are doing so," Mr Mitchell told reporters after Israeli Prime Minister Benjamin Netanyahu and Palestinian President Mahmoud Abbas met in Jerusalem. "The two leaders are not leaving the tough issues to the end of their discussions," he added. "We take this as a strong indicator of their belief that peace is possible."